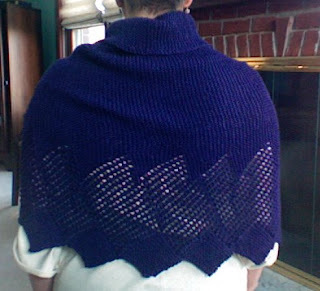 I have finished a lacy shawl I knitted for my mother. The yarn and pattern were a gift from my sisters to my mother, but with her ailing eye sight, she was afraid she wouldn't be able to work on the project. So, she asked me to knit it for her. At first it seemed daunting because the bulk of it is a 24-row pattern, but once you understand how the rows work together, it becomes easy to memorize, and there are no overly difficult stitches. The "ties" in the front were complicated, though. 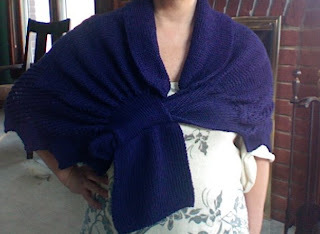 One of them has a pocket that the other slides into so the shawl will stay on your shoulders, and you won't have to fiddle with it to keep it on. I think I'd like a narrower scarf without the ties made with this pattern, so my next project is to figure that out. That's a really nice pattern, Scout and a lovely colour too. I'm really bad at counting rows, so I don't think a 24-row pattern would beup my street, but I like this so much I'll keep it in mind. Is the pattern online? Yay! So it IS blue! It looked purple on our videochat camera. And Pea: Hoorah for typos forming accidental new words. The verb to "beup" sounds cool, though I can't think of a definition yet that might apply to your street. Happy birthday this weekend, by the way. Pea, a belated happy birthday to you—I'm sorry I didn't get here sooner. I'm not much for counting row either, so I kept a little counter on the end of one needle. As long as I remembered to advance the dial, I was OK. It's not online, but I can copy it for you if you'd like.